Yes, its time for another vegan food review and this time I chose Good Life Spinach and Nut Grills. ASDA Used to sell these last year but leading up to Christmas they stopped selling them, perhaps I was the only one that bought them and that wasn't that often as I haven't got a freezer! Luckily there is a health food shop in our town which will buy in specific items you wish to purchase and after a quick visit to them, they were more than happy to order me a packet in. It actually worked out cheaper than ASDA so it was a bargain too without the effort required of ordering them online! I served mine on a wholemeal bap with sliced tomato and beetroot on the bottom, with a drizzle of vegan garlic mayonnaise. The burger itself was topped with a baked portabella mushroom and tomato sauce. 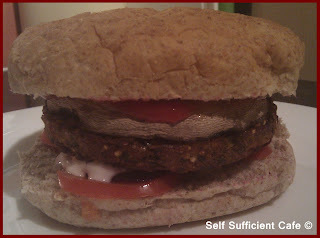 The Spinach and Lentil Grill held together really well and didn't break up when transferred to the wholemeal bap. The taste was awesome and in my opinion these bad boys are by far the best burger option for vegans! The portabella mushroom complimented them perfectly, next time I'd add a few salad leaves to the bottom, for colour not taste. There you have it I saved the best to last. My regular readers will know that S has been in hospital for some time now after being diagnosed with Guillain Barre Syndrome (GBS). I'm pleased to report that she is on the mend, although it will be a slow process, GBS also stands for Get Better Slowly. She requested a lemon drizzle cake but not of the vegan variety, which I baked for her. But there was no way that I was going to miss out so I altered the recipe to make a second cake which was vegan friendly. Unfortunately it wasn't a 100% success. So I will go back in the kitchen and tweak my recipe. Once I'm completely happy with it I will share the recipe. The cake was edible but I felt that it was a little under cooked although it had been the oven long enough. Perhaps I drowned it with lemon too early after I had baked it. Whatever the problem was it just didn't feel right. It was very lemony though and that's something I won't be changing. Watch this space for the final recipe which I'll be happy to share. Almost three weeks ago I blogged about my houmous salad sanga and I told you that I would be pairing up beetroot and houmous sometime soon as I thought they were a perfect match. Using two thirds of a can of chickpeas make a standard houmous using chickpeas, tahini, garlic, cumin, lemon juice and chickpea water. If you look closely you will see little flecks of green. The flavour was just as I imagined it, the basil balancing out the beetroot. Use on a wrap with other salad ingredients or as a dip with crudites and enjoy! Hubby and I went out the other night, which is a rare treat these days! We had bought some tickets way back to see Al Murray and decided to go out for a meal before the show. Now like most of you who live outside London, Brighton or a big city, it's normally very difficult to find a restaurant that caters for vegans. This is especially true, where I live! My local town doesn't have many independent restaurants and mainly consists of fast food chains, pub food or other restaurant franchises, like Bella Italia, Pizza Express and Pizza Hut. However, fairly recently one of the popular hotels which also has a restaurant, bistro and bar decided to hold a vegetarian and vegan night once a week which has proved to be fairly popular. The menu also includes options for vegans which are even labelled and when asked the chef is more than willing to 'veganise' a certain dish on the menu. You are never treated as a "freak" and you never get asked the standard question "a vegan! What do you eat?". Over the last few weeks through Birthday meals at work and girly get togethers I've eaten there 4 times! The first time I was able to chose something from the specialised vegetarian/vegan menu and I chose hummus and roasted red pepper babaganoush with chargrilled flatbread as a started followed by Sri Lankan sweet potato, coconut and pea curry with cashew nuts and basmati rice. Both dishes were extremely delicious and far too tasty to stop eating and take a photo! The second time I went I chose from the main menu which had two vegan options, yes two, I was spoilt for choice! 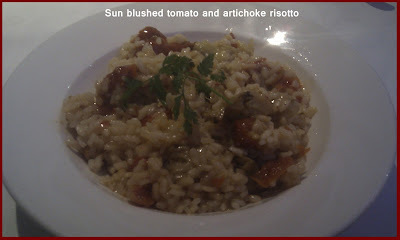 I chose sun blushed tomato and artichoke risotto. This time I took a photo! The third time I went I chose again off the main menu but this time I asked if something could be "veganised". It was no problem as everything is cooked from scratch, which means that you do have a bit of a wait compared to your bog standard pub food grub but its worth it! I chose four bean and coconut curry with saffron scented rice. This isn't something I would chose normally but I was willing to give it a try as all previous choices had turned out well. I wasn't disappointed, it was delicious. 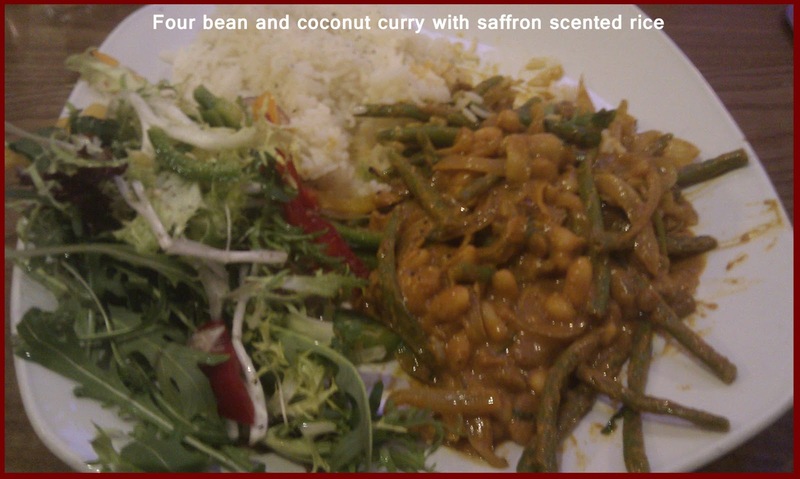 The fourth (and by no means the last) time I visited I chose the four bean and coconut curry with saffron scented rice again as I was blown away with it the first time I had it. 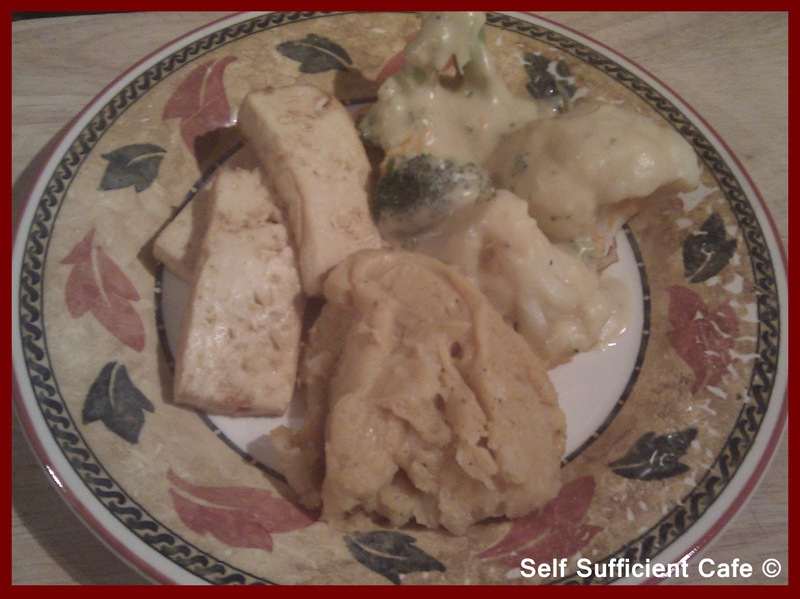 Once again it was no problem to "veganise", but what did surprise me was that it was different to the first time I had it which just proves that each meal is cooked from scratch. This time I did take a photo of it. 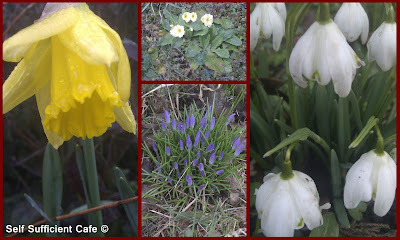 There's a theme emerging from this blog and its of the Mexican variety! So far I've posted the following Mexican recipes; Fajitas, Tacos, Mexican Stuffed Mushrooms, Guacamole, Salsa and a Refried Bean Wrap! 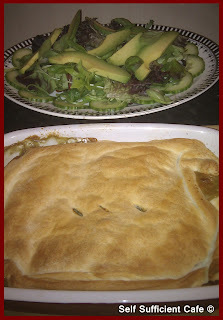 I'm now going to add to that list and share with you my version of a Mexican Lasagne. This uses flour tortillas instead of lasagne pasta sheets. Fry the diced onion in a little rapeseed oil until translucent. Add the diced aubergine and courgettes and stir to combine. Continue to fry the vegetables for around 5 minutes, if they start to stick add a little water. Add the red pepper and cook for another 5 minutes. Sprinkle over the fajita seasoning mix, paprika, chilli flakes and garlic granules and mix thoroughly. Add the tomato passata and stir through. Cook over a medium heat for another 5 minutes. Meanwhile make your 'cheese' sauce. Add to a saucepan, the soy milk, vitalite and flour and cook over a low heat whisking all the time until the sauce starts to thicken. Add the mustard and nutritional yeast flakes and whisk to combine. Taste and add more mustard or nutritional yeast flakes to your liking. Spread a third of the vegetable mixture in an oven proof dish and top with a flour tortilla, its best to half the tortilla and put the straight edge of the cut tortilla to the edge of the oven proof dish. Spread another third of the vegetable mixture over the tortilla and continue to layer until you finish up with the third flour tortilla. 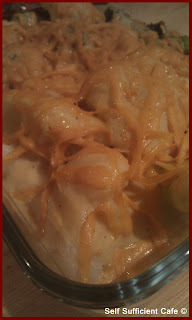 Pour over the 'cheese' sauce and bake in a moderate oven for 30 minutes. 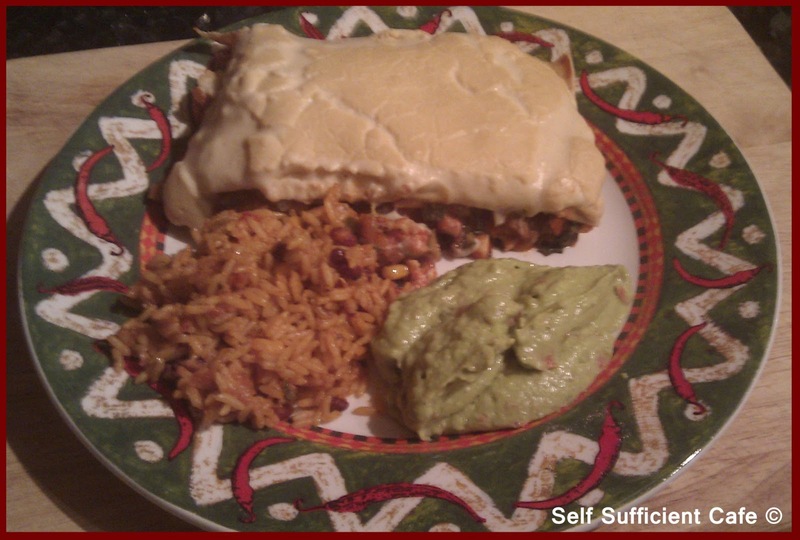 Serve with mexican rice and guacamole. I fancied something spicy tonight, it needed a kick but I also craved true flavour, my mind was cast back to a memorable night out in a gorgeous Thai restaurant that catered for vegans and I was in heaven when I tasted their version of a green Thai vegetable curry. 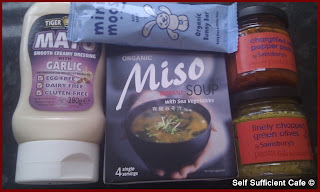 Then I remembered in my February vegan food parcel Caroline from tea and sympatico had included a vegan Thai green curry paste! Lets rock and roll! I fried an onion in a little olive oil and added butternut squash, sweet potato, cauliflower, broccoli, baby corn and marinated tofu pieces. Next I added the Thai green curry paste and stirred to combine fully. Swiftly followed was a tin of coconut milk and I let everything simmer until the vegetables were tender. The taste was extremely authentic and I enjoyed every mouthful. This weekend we had another downpour of the white stuff, whilst I don't particularly like driving in the stuff I don't mind a brisk walk through it! After a lazy morning reading and playing with Marco, I got myself wrapped up, donned the walking boots and out I ventured with Marco in tow, or should I say steaming ahead! Today Marco took me for a walk. 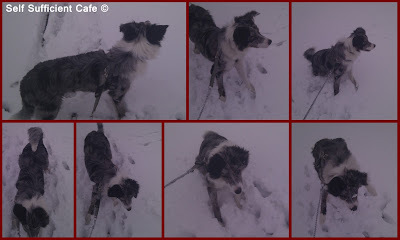 He loves the snow and loves jumping into the drifts and jumping up to catch snowballs. In fact he can't get enough of the stuff! In the week we're out walking at 6:30am which I actually enjoy, whatever the weather, even the mornings where I've battled snow have been pleasant! 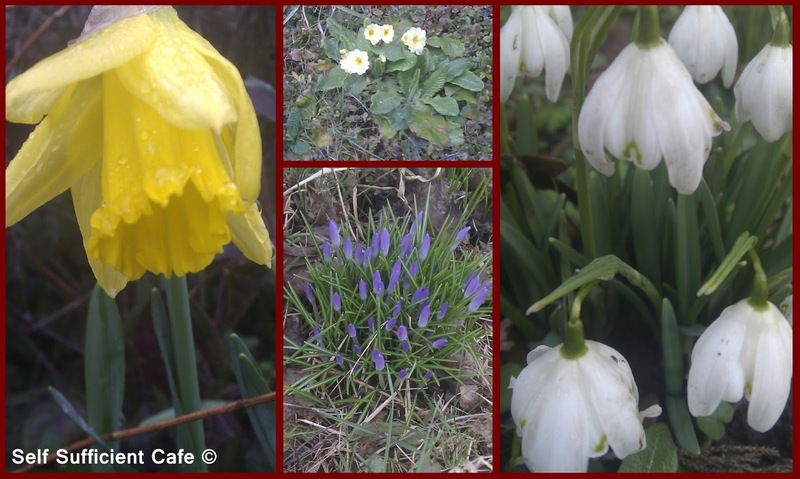 I'm amazed at the spring flowers that I have seen though over the last few days despite the weather. Nature continues to amaze me. 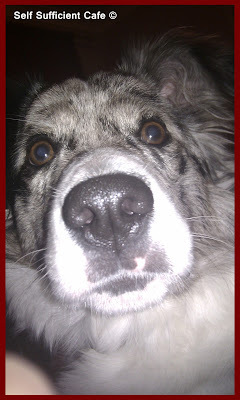 I'll leave you with another photo of Marco. He's actually quite camera shy so this picture is one in a million! After a successful vegan food swap box last month I couldn't wait to be part of the March swap. If you've not heard of it before its a scheme run by to happy vegans who organise it. 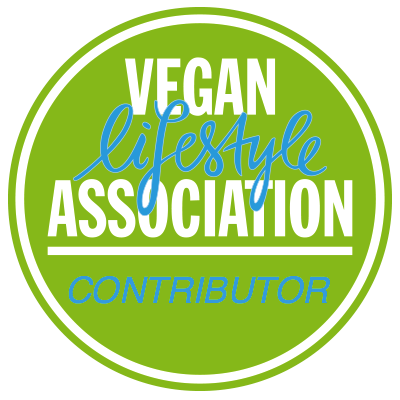 Every month you are assigned a partner to send a parcel of vegan goodies to and in return you receive your own parcel from another. The budget is £10 not including package and postage. Its really good fun and I can't believe how excited I get leading up to it! This month I was assigned Christine, who unfortunately hasn't got a blog. She advised me that she tends to lean towards healthier food but she was up for trying anything. This box was going to be completely different to my previous box I'd sent. Organic Miso soup is a wonderfully unique combination of brown rice, sweet white miso, the mineral rich sea vegetables Kombu and Wakame and dried green onions. It makes a great soup by just adding hot water, which is delicious and convenient. If you're yet to find a vegan alternative to mayonnaise then this is it! I have tried Plamil mayo and other brands in the free from aisle of my local supermarkets but nothing comes close to Tiger Tiger especially the Garlic one. It really is the best out there by far! I have yet to try the sainsbury's finely chopped green olives or the chargrilled red pepper paste, but both look delicious and labelled vegan too. I was thinking along the lines that they were a good store cupboard ingredient to have to hand for quick and tasty meals. I'm assuming the chopped green olives is similar to an olive tapenade without the fish sauce, or it could be quite easily turned into it! I'll post a recipe soon for an olive tapenade, but I definitely think its a summer recipe steeped in Greek memories. The chargrilled red pepper paste would be good in a wrap or used as a pizza sauce for a different twist. 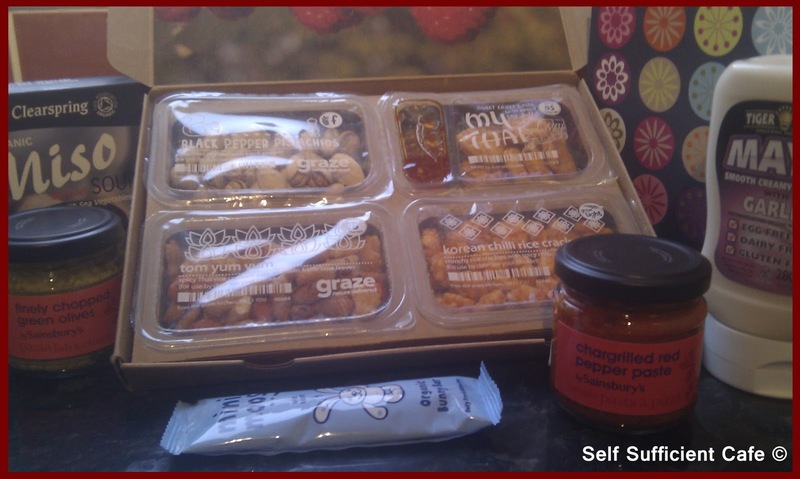 As always I added a 'graze' box which consisted of black pepper pistachios, sweet chilli bites, spicy Thai rice crackers and Korean chilli rice crackers. AND of course this vegan swap box wouldn't be quite right without an Easter treat, so to finish it off I included a Mini Moo Bunny bar. It's time for another food review and this time I cooked Goodlife Nut Cutlets. I found these in the freezer section of the local Sainsburys. I'd previously tried the Goodlife Spinach & Lentil Grills and was pleasantly surprised with their taste and texture, I'll blog about them soon. It was time to see what the Nut cutlets could do. 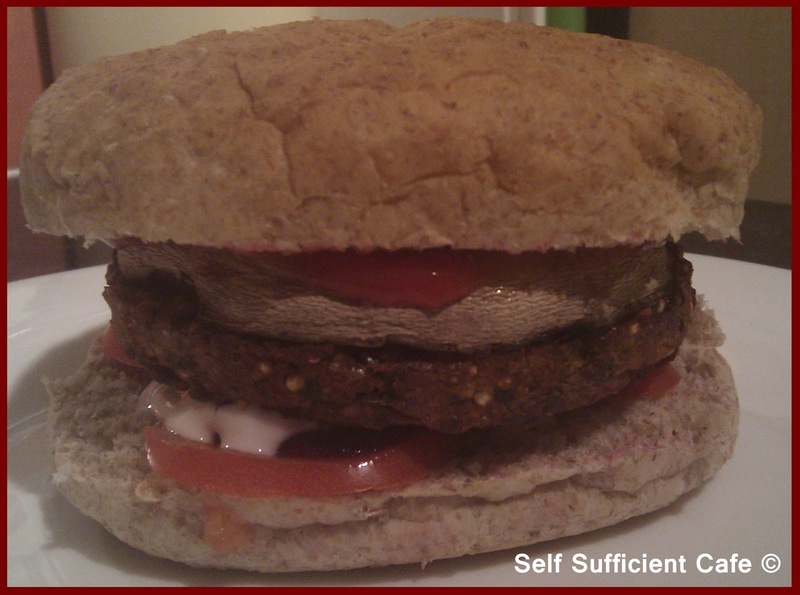 As with all three other 'burger' type vegan food reviews, I served these on a wholemeal bap with toppings. 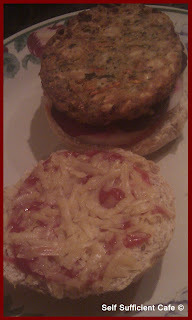 On the bottom I layered tomato, onion, beetroot and a light drizzle of garlic mayonnaise and on the top tomato sauce and vegan cheese melted to its best ability. I'm still yet to find a melty vegan cheese. The nut cutlets held their shape very well and didn't crumble. 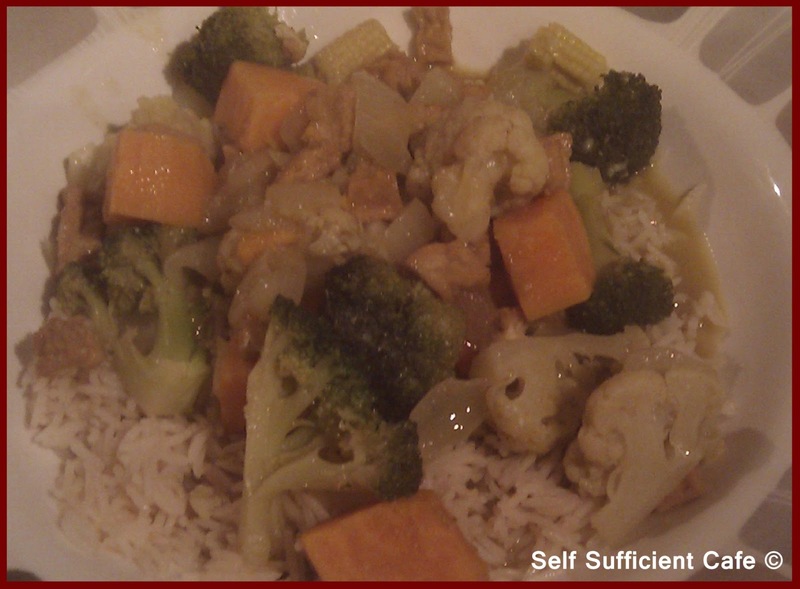 The texture combined soft vegetables including onion, carrot, parsnip and spinach with chunks of peanuts and cashew nuts. The packaging also suggested cooking these straight on a BBQ straight from frozen turning regularly and cooking for 15 minutes or so. One to remember for those long summer days of BBQ's, sun and fun. 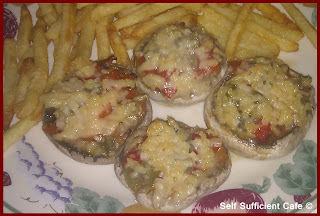 Another suggestion was to break them up and use instead of mince to a bolognaise sauce with chopped mushrooms and onions. I'm not 100% convinced with this suggestion as they didn't seem to crumble. But this made them ideal for a burger bap! What are your favourite vegan burgers? 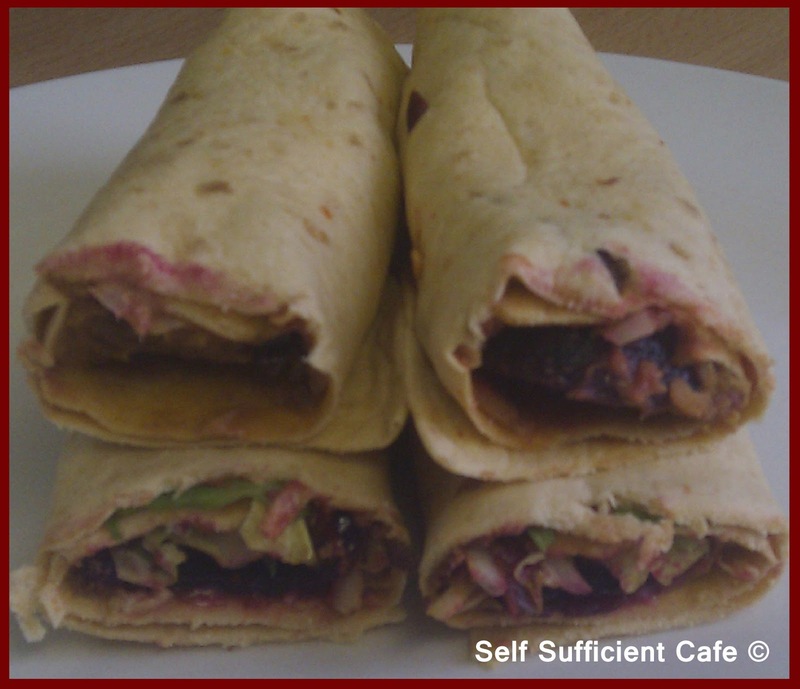 Two days ago I blogged about the Mexican Bean Deli Filling that Caroline of Tea and Sympatico sent me which I used in the Mexican Bean Deli Wrap. I didn't use all of the jar so I needed to come up with another recipe idea that used the rest of the deli filling. I needed something quick, I was ravenous after a long day at work, so I stopped off on the way home and picked up a bag of frozen chips and paired this with stuffed mushrooms. I put a dollop of the Mexican Bean Deli Filling in the centre of each mushroom and then topped it with a piece of roasted red pepper from a jar and chopped jalapenos from another jar. Finished with a sprinkling of vegan cheese and baked in a moderate oven for about 20 minutes. Result a very tasty stuffed mushroom that was quick and easy to put together with store cupboard ingredients. OK I may be a day or so late with this one! 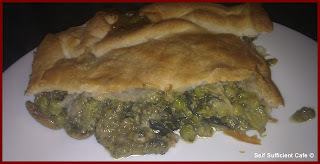 But after I'd made the pie I couldn't call it anything else it was full of greens. On returning home from work tonight my lovely friend gave me a bag of olives that she had bought at the edible garden show. They looked lovely and the cogs started turning as to what I could do with them. Of course, I could have eaten them on there own and I did eat a couple whilst contemplating what I could make. The first thing that sprung to mind was to make an olive tapenade, delicious as it is these olives needed to be turned into tonight's tea. I also had a delivery of my weekly graze box and lo and behold there were some more olives included in this weeks box. 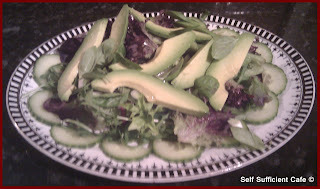 Both green and black in a lemon and rosemary dressing. I raided my fridge to see what else I had or needed using up. I found half a bag of spinach and kale, some peas and a packet of purple sprouting broccoli. I've never bought purple sprouting broccoli before as its a regular in my raised garden but unfortunately last years plants haven't yet produced any and the local supermarket was selling it at a reduced price. I also had a packet of ready rolled puff pastry, the jus-roll is vegan, I bet you didn't know that! Saute the onion in a little olive oil until translucent, then add the purple sprouting broccoli and stir fry for around 5 minutes until the broccoli has softened. Add the washed spinach and kale and stir till the leaves have wilted. Add the frozen peas, and stir to combine. Be careful not to mash up the purple sprouting broccoli. Add the flour and mix thoroughly, then slowly add the soy milk, stirring all the time. Cook until thickened and add the olives, salt and pepper. Pour into an oven proof dish and top with the puff pastry. Bake in a moderate oven for 30 minutes or until the pastry is golden. 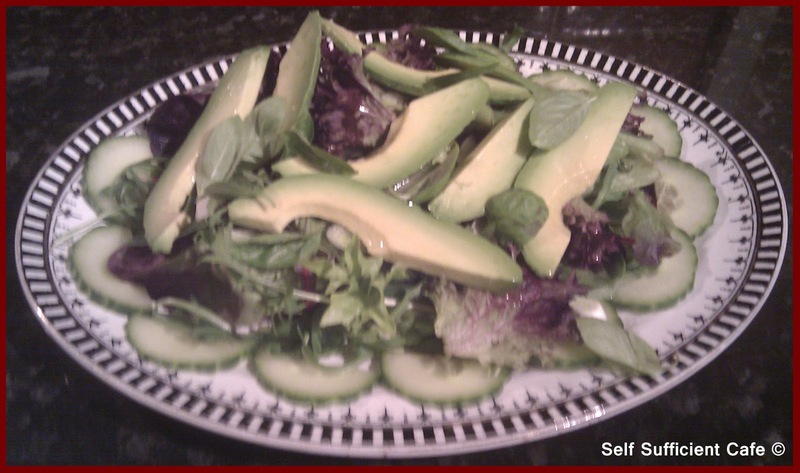 Serve with a green avocado salad, dressed with lemon juice and olive oil. 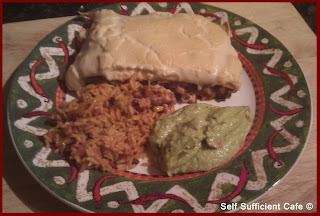 Last Month, my Vegan swap box contained a Mexican Chilli Bean Deli Filling, thanks to Caroline at Tea and Sympatico. It was used in two delicious meals. 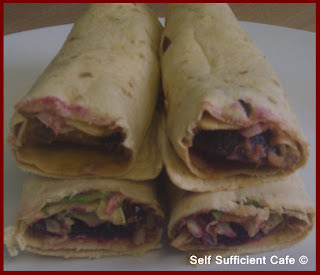 The first was a quick lunch for a work day, Mexican Chilli Bean Wraps. Spread a flour tortilla with the Mexican Bean Deli Filling and add layers of salad about a third of the way down before rolling. I used similar ingredients to my Houmous Salad Sanga; baby leaf salad, tomatoes, cucumber, spring onion, beetroot, olives and gherkins. 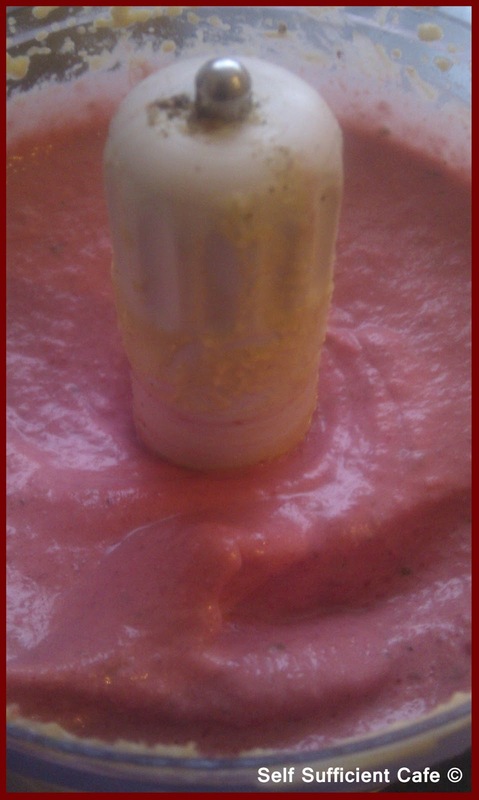 Then to finish it off squeeze just a little garlic mayonnaise over the top (vegan of course). My favourite vegan mayonnaise is available from Sainsbury's and is called Tiger Tiger Garlic Mayonnaise. This lunch didn't last long, because I was hungry and it was so tasty. The Mexican Bean Deli Filling made a nice change to houmous too. But I do love houmous! A few days ago I shared with you that I had 9 vegan recipe books, which I hadn't used, so I set to and made the Happy Herbivores Brownies and Baked Tofu with Mustard sauce. BUT it also sparked off something else. I realised I didn't have any recipe books for vegan cakes and as I reported previously I don't have enough confidence to start from scratch (yet). So I found myself searching the internet for a book that would teach me the basics and offer some yummy recipes. I wasn't disappointed with my search, I found and bought: Vegan Cupcakes Take Over The World: 75 Dairy-free Recipes for Cupcakes That Rule by Isa Chandra Moskowitz & Terry Hope. The day it arrived I went to bed early and read it from cover to cover! I couldn't wait to try some of the recipes. As from previous experience it actually took me time to do just that. 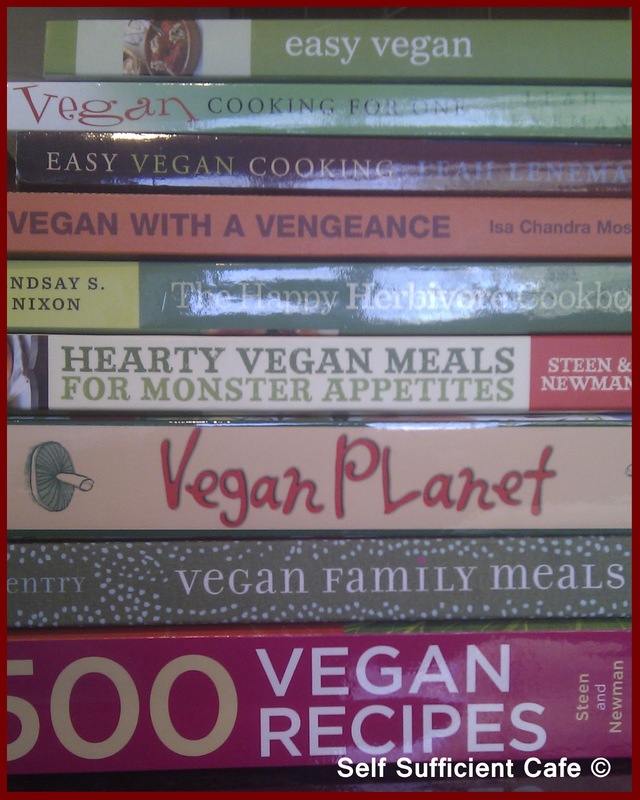 This makes 10 vegan cook books with very few recipes made! This is getting to be a habit. I'm too engrossed in the kitchen coming up with my own creations to have the time to cook something from one of my now 10 vegan cook books. However, I had the perfect excuse, I wanted to say thank you to all my friends and colleagues at work who had donated money to the Guillain-Barre Syndrom Support Group Charity. Regular readers will already know that a close family member, S, had been diagnosed with this awful disease a few weeks back and was in critical care. I'm please to report that S has started the road to recovery and is out of critical care. S has a long way to go but is surrounded by a positive Support Group Family. We wanted to give something back and two of us (not me!) are running the local half marathon to raise money for the national charity Guillain-Barre Syndrom Support Group. They went down an absolute treat and I was praised on the moistness of the sponge, no-one could believe they were vegan. RESULT! Once again, and I apologise, the photograph is rubbish! It does not give these marvelous beauties the justice they deserve. After a visit to the local supermarket I came away with a few bargains! I always head to the reduced price bit in the fresh fruit and vegetable section. I came away with a pack of parsley, a savoy cabbage, a courgette and a red pepper. I was feeling creative and couldn't wait to get home after I'd done the rest of the shopping. It didn't take me long to come up with the following recipe, after all what else can you do with savoy cabbage leaves other than stuff them! Well, yes, you could make vegan bubble and squeak, perhaps that'll be my next recipe. I also remembered to weigh everything before I started cooking so I have the exact amounts I used. All in all this recipe cost me next to nothing, infact for the 12 cabbage rolls I made cost less than £4.00!!! Finely chop all fresh ingredients bar the cabbage. Separate the leaves from the cabbage and rinse to get rid of any excess soil and pat dry. Remove the centre vein from each cabbage leaf to about half way up. Saute the onions and garlic in a little olive oil until the onion is translucent. Add the pepper and continue cooking over a medium heat. Add the courgette and mushrooms and cook further until the vegetables are soft. Whilst the chopped vegetables are cooking, blanch the cabbage leaves in boiling water for about 3 minutes. Remove and drain, patting them dry with kitchen roll. Be careful not to rip them! Leave to cool. Add the spices to the chopped vegetables and stir to combine, add a little cabbage water if the mixture is too dry. Drain the green lentils and add to the chopped vegetables and spices, next add the nutritional yeast and mix thoroughly. Continue to cook over a low heat for another couple of minutes or until the lentils are warmed through. 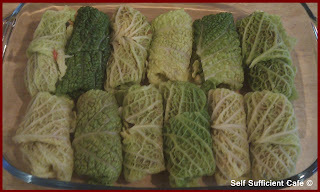 Flatten the cabbage leaves on a clean surface and add a dollop of the mixture to the top centre of each leaf. Fold in the sides and roll finishing with the seam on the underneath. If after the stem has been cut out you don't have much of a full leaf left, place the leaf down so that one side of the leaf overlaps the other where the stem was. This should roll and keep the filling in the middle. 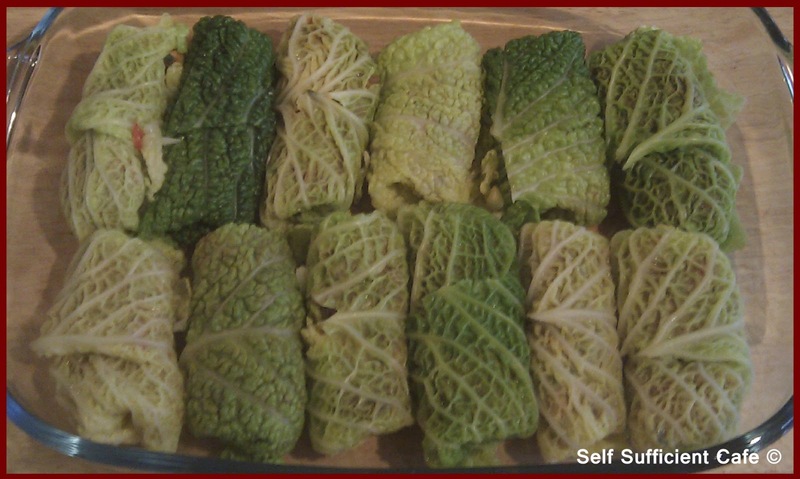 Place the wrapped leaves in a baking dish and pour over about 4 tablespoons of the cabbage cooking water and tightly wrap silver foil over the top. Bake in an oven at around 180°C for 20-30 minutes. Serve with mash potato and vegetables or chips and salad. Enjoy! Readers of my blog will know that I used to be a cheese addict and since turning vegan I have tried many vegan 'cheese' but nothing has taken me by storm. However recently I ordered Teese after hearing about how good it was and how well it melted. I will update you all on my findings once I use it. My cheese replacement however, is houmous! Today I enjoyed houmous on a granary baguette with lettuce, tomato, spring onion, beetroot, pickled gherkin, olives and vegan garlic mayonnaise. Delicious! The baked tofu was a success, the other day and I really enjoyed the texture and flavour. 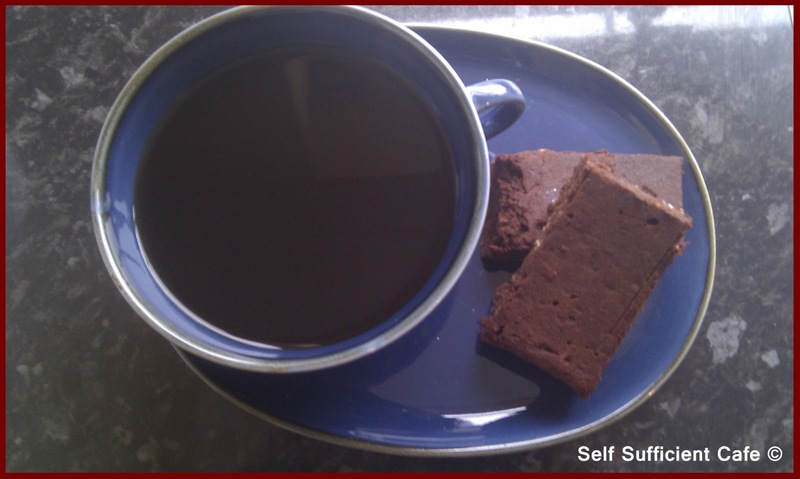 So I thought lets give the Happy Herbivore another go and I was so excited about trying the blackbean brownies. Sometimes when I'm cooking and the ingredients don't at first seem the obvious ingredients to use, like in this recipe, my mind takes over and tells me that the food will taste horrible before I've even tried it. But this time I was not going to let this happen, I needed to find something sweet that I could eat that was healthy(ish). This recipe did not fail to impress. I must make a second batch very soon! I think they will definitely be one of my favourites and one to cook up for 'cakes day' on my birthday for the office. I just need to find some other vegan cake recipes, I don't think I'm that confident to try making vegan cakes from scratch just yet. I enjoyed my first brownie with a cup of strong black coffee. No I didn't, I don't like coffee that was just for the photo I had mine with a big mug of earl grey tea! Delicious. The recipe can also be found on The Happy Herbivore website. I didn't have any instant oats but I did have wholegrain oats and I don't think it spoilt the recipe at all. 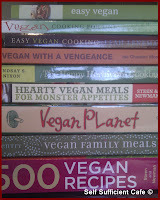 Two days ago, I told you that I was going to give a few recipes a go from one of the nine vegan cookbooks I own. I chose The Happy Herbivore cookbook because it is illustrated beautifully and you can see what your recipe should look like when you're finished. 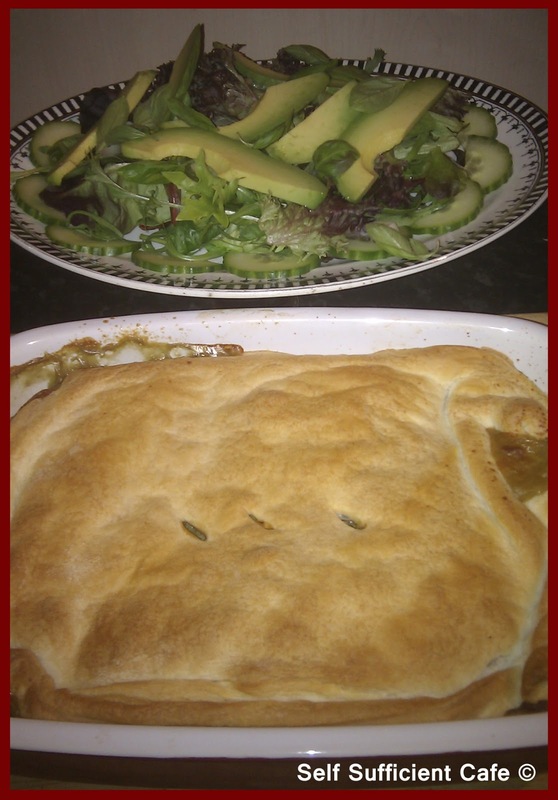 Strangely though the two recipes I chose hadn't got a photograph! I chose Baked Tofu and Mustard BBQ Sauce. The BBQ Sauce called for ready prepared yellow mustard and all I had in my store cupboard was English Mustard powder, which I used. Boy this sauce was way too hot for me! Thinking about it now I think the yellow mustard the book was referring to was American mustard which I believe isn't as hot as English mustard. You live and learn! I diluted some of the BBQ sauce with hot water and marinated my pressed tofu in it for most of the day. I used my 9 vegan cookbooks as a weight for when I was pressing the tofu, see they've come in handy already! I had a little mash potato left over in the fridge which I'd made with vitalite and soy milk, but it needed sprucing up. I added chopped onion, a little of the mustard BBQ sauce and some of the remaining grated 'cheese'I used for the Broccoli and Cauliflower bake. After stirring both the onion and 'cheese' through I microwaved on high for 2 minutes and stirred through again. The photograph really doesn't give the food much justice but believe me it was tastier than it looked! Now I must add that camera to my birthday list! Well I didn't get round to cooking something from one of my 9 vegan cookbooks tonight! All I fancied tonight was a plate full of vegetables, but my taste buds needed tantalising and a plate of cooked vegetables on their own just wasn't that appealing. In my days pre-vegan, one of my favourite dishes was cauliflower cheese, I couldn't get enough of it. I really was addicted to cheese! My Nan, bless her cotton socks was the best cauliflower cheese maker in the WORLD! Nothing ever came close that I made or indeed anyone else. The recipe was never passed on and we will never know what she did to make it so tasty. No-one can put their finger on the secret ingredient. My Mum has come close but never quite close enough. Since I've transferred to a vegan diet I no longer eat cauliflower cheese for obvious reasons but I still crave my Nan's dish! The reminiscing of Nan and her infamous cauliflower cheese dish had wet my appetite, I needed to veganise this dish and that's what I did! Turn on your oven to pre-heat at 180°C. Dissolve the vegetable bouillion powder in a saucepan of hot water and bring to the boil. Add the cauliflower and cook for 4-5 minutes, then add the broccoli and cook for a further 5 minutes or until the vegetables have cooked and still have a little bite. Transfer to an oven dish. Meanwhile pour the milk into another saucepan and add the vitalite and flour, whisk over a low heat until the vitalite has melted and the flour has been whisked in with no lumps. Add the English mustard and stir through. As the liquid starts to thicken add the nutritional yeast and whisk. Have a quick taste and add more mustard, nutritional yeast as required. Add the black pepper whisking all the time. Once the mixture has reached the desired thickness to your liking pour over the cauliflower and broccoli. Grate over the non dairy cheese of your choice. I used cheesly melting (non dairy & non soy). Bake in the oven for 15 minutes. Serve with a garden salad, mash potato or chips and peas. I haven't blogged for a few days as I have been busy working, visiting S in hospital and catching up on Marco and Hubby time and SLEEP! I can't believe how tired I have been recently, which has meant that I haven't been very creative in the kitchen so I thought this would be a good time as any to try out a recipe from a vegan cook book. You can buy all the above online, I think most of them can be bought on Amazon. All I have to do now is decide which one to cook something out of first! On a quick look through I think the Happy Herbivore is taking my fancy especially the Baked tofu with mustard BBQ sauce and then there's the Blackbean Brownies. Sounds scrummy! Can't wait to start cooking.